Maryland is widely known as having some of the strictest gun laws in the entire country. Few states have provisions that even come close to the highly controversial law, which requires citizens to prove a good and substantial reason to possess a carry permit. Maryland also requires mandatory background checks for all gun purchases, regardless of whether the seller is a licensed dealer or a private party. There is also a mandatory seven-day waiting period in order to buy a gun. And now after the close of this years legislative session in Annapolis, the strict are bound get stricter after The General Assembly passed new firearms regulations. The bill, which has generated national attention, is awaiting Governor O’Malley’s signature before it becomes law. All prior indications from the Governor’s office have signaled that signing on the dotted line is a foregone conclusion. The new law will have a sweeping impact on all aspects of firearms regulation including purchasing, possessing, and selling. The new regulations include an all out ban on 45 different types of assault weapons. This particular component of the bill has perhaps garnered the highest degree national medial attention. Most of this attention has been generated by the National Rifle Association, which is already on record expressing its intention to challenge the bill in court. NRA president David Keene expressed extreme displeasure with Maryland lawmaker’s decision to place a blanket ban popular assault rifles such as the AR-15. This model of assault rifle gained worldwide notoriety for being the weapon used in the Newtown shootings, but the NRA insists that a blanket ban would violate a United States Supreme Court ruling. The ruling states, “one kind of firearm that cannot be banned is one that’s commonly owned and widely used for legitimate purposes.” While the language used in this ruling leaves much for interpretation, the state Attorney General and the Governor believe that the new bill would ultimately be upheld as constitutional by the high court. 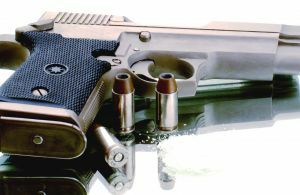 Other components of the new firearms bill include ammunition limits of 10 bullets per magazine. Popular handgun models in America, such as the Glock 19 are commonly used with magazines that carry over 14 bullets. The bill also prohibits anyone who has been involuntarily committed to a mental institution from owning a handgun in Maryland, and requires gun owners who have lost their weapon to report the loss to state authorities. Some would argue that the most controversial component of the new bill is the requirement that all prospective gun purchasers submit their fingerprints to the State Police to be kept on file. This requirement arguably creates an undue burden upon law-abiding citizens, and infringes upon the Second Amendment’s guarantees. Background checks are one thing; they don’t require a person to submit to government authority. But a fingerprint requirement affords the government one more opportunity to watch over the public in a big brother esque sort of fashion. Finger print technology is not fool proof and it’s highly conceivable that this information could be misused. Many future gun owners and the NRA are asking why they should be fingerprinted like someone who is booked for a crime, simply for exercising their Second Amendment right to bear arms. But the General Assembly and Governor O’Malley do not share the same concerns about this infringement, as the bill is set to be signed into law any day. Benjamin Herbst is a gun crimes attorney practicing in all Maryland jurisdictions and in Federal court. Contact Mr. Herbst for a free consultation about your case.